Chefs are putting their signature on homespun chicken preparations, such as chicken Alfredo, and customers are flocking to order them. 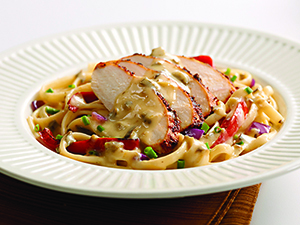 Try this take on chicken Alfredo and spice up your pasta night. In med. sauté pan over med.-high heat, heat 1 tbsp. oil. Sauté onions and peppers in hot oil 3 to 4 min. until soft and lightly caramelized. Add alfredo sauce to pan; whisk in poblano concentrate. Coat chicken breasts with Cajun seasoning. Add 1 tbsp. olive oil to a separate sauté pan set over high heat. Sauté chicken breasts until fully cooked to 165°F. Remove from pan and let chicken rest 1 to 2 min. ; cut into thick slices. Add hot pasta to poblano alfredo sauce; toss to coat thoroughly. For service, place sauced pasta into a bowl and top with sliced chicken breast and chives.